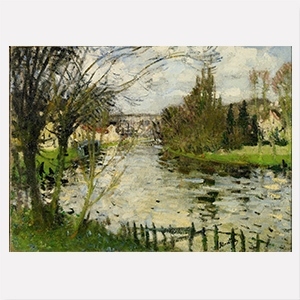 The Post-Impressionist painter Pierre Eugène Montézin was born in Paris in 1874 as the son of a lace draftsman and trained as a decorative muralist. Determined to become an independent artist, his attempt of being accepted to the Paris Salon failed in 1893, when he was only nineteen, but succeeded a decade later, thanks to the professional guidance of the artist Ernest Quost (1834–1931). After serving in WW1, Montezin settled in Dreux and Moret in the countryside west and south of Paris, producing bright, sunlit paintings of villages and rural scenes en plein-air, with a spontaneous brush. He was appointed to the Légion d’Honneur in 1923, President of the Salon Jury in 1932, and elected at the Académie des Beaux-Arts in 1941. Montézin died in 1946. His work can be found in numerous French and international museum collections.